Last week, the unthinkable happened: I realized I'd run out of fancy tea-themed soaps! I've had so many of them for so long, I just assumed that basket underneath my bathroom sink still contained some nice green tea soaps, but alas, the cupboard was bare. While out shopping over the weekend, I was plundering through the pile of pretty soaps at a Tuesday Morning store when a portion of a vintage graphic caught my eye. 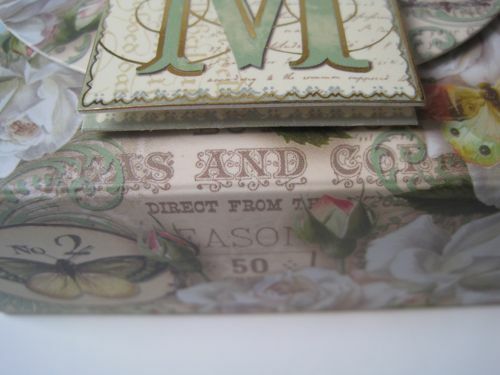 I hadn't seen any tea soaps at all, but then I caught the words "Sanborn" above the letter M and a hint of what I knew was "Teas and Coffees" here. I still don't know how I managed to see that! 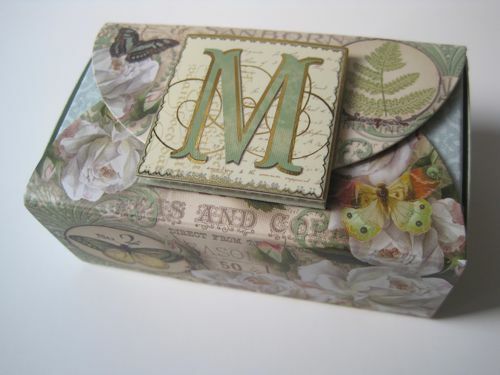 When I turned the box over, it confirmed that yes, this was Green Tea Soap with cute packaging from Punch Studio. 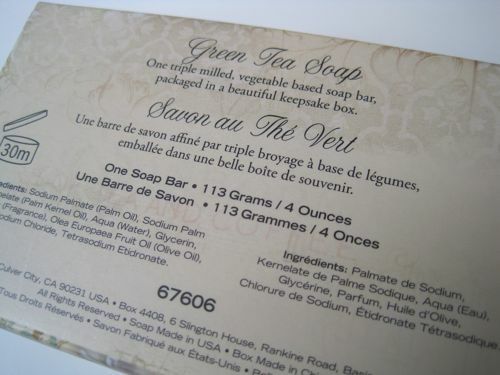 This is one of those times when the ingredients don't include any camellia sinensis, so I'm guessing it's just the fragrance, or perhaps the inspiration of green tea, in this soap. 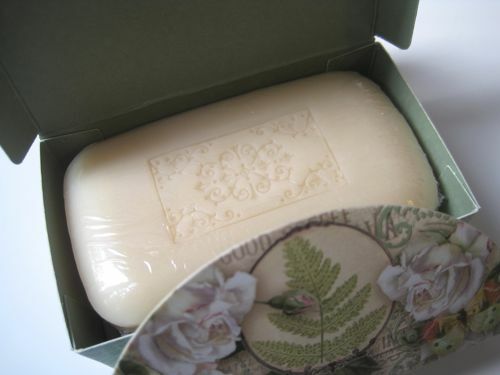 Whatever the case, this $3.99 bar of soap smells dreamy and lathers up nice and creamy. Have you seen any tea-themed soaps lately? Obviously I haven't been keeping up! A Barnes & Noble bargain on tea! When fall officially arrives, my tastebuds are ready to party. A new season means new teas, and I found two that were quite a bargain at Barnes & Noble in Rome, Ga. over the weekend. 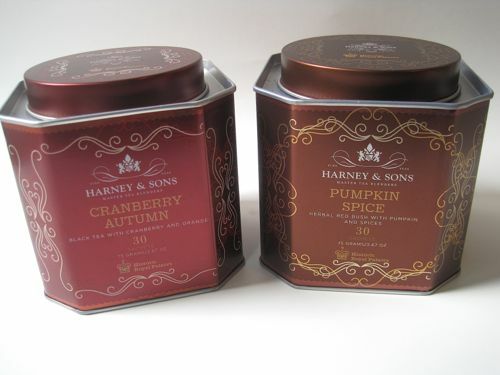 Although a girlfriend introduced me to Pumpkin Spice tea sachets from Harney & Sons last year, I had not tried their Cranberry Autumn tea sachets. 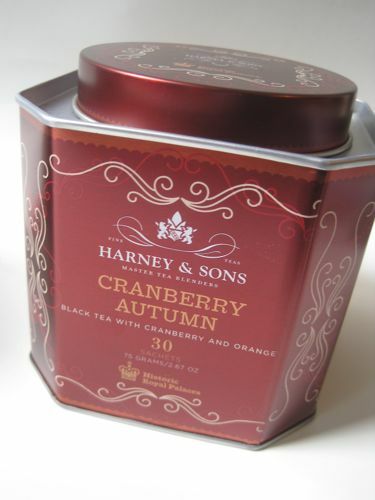 Cranberry Autumn loose leaf tea, yes, but tea sachets, no. Could they possibly be as good as that beloved tea? Well, the fall teas were two for $15 at B & N, and I happened to have a gift card, so they came home with me. 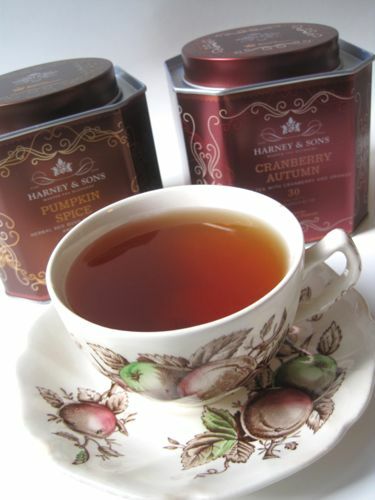 And I'm delighted to report that Cranberry Autumn tea is just as delicious as ever! I do believe this is my all-time favorite fall tea. What's yours? When I started researching old department store tea rooms several years ago, my goal was to obtain a vintage postcard and a recipe from each one. Most of the stores seem to have shared at least a recipe or two, but I have yet to find one I can trace with any certainty to Emery, Bird, Thayer Co. in Kansas City, Missouri. 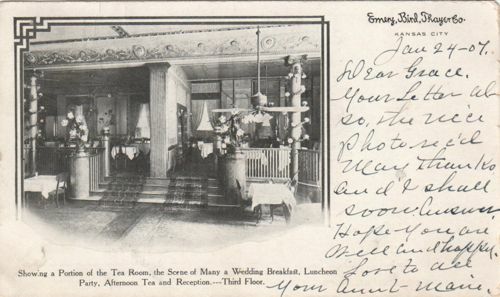 Still, I was happy to find this lovely old department store tea room's postcard, which was written on Jan. 24, 1907: "Dear Grace, Your Letter also, the nice photo rec’d. Many thanks and I shall soon answer. Hope you are well and happy. Love to all. Your Aunt Marie." 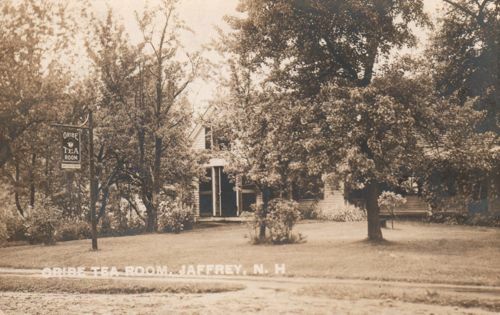 I also liked the information printed below the photo: "Showing a Portion of the Tea Room, the Scene of Many a Wedding Breakfast, Luncheon Party, Afternoon Tea and Reception.---Third Floor." 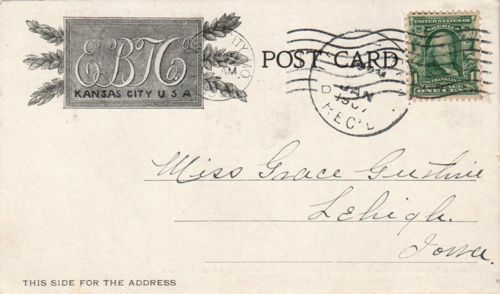 And here's the back of the card showing it was mailed to Miss Grace Guthrie in Lehigh, Iowa. While the Emery, Bird, Thayer Co. is no more, a piece of it lives on thanks to the EBT Restaurant operating in Kansas City today. According to their website, "EBT Restaurant was opened to honor that department store, which has ties to Kansas City history dating back to the late 1800′s. The stained glass, much of the masonry, wrought iron archways and most notably, the two brass elevator cages were all salvaged when the EBT Department Store was demolished in 1971. As many of our guests are aware, you can reserve a table in one of the two elevator cages, thus feeling somewhat transported to another time and place! Each ‘Elevator’ can accommodate up to 4 guests." Now wouldn't that be fun? You can see a picture of one of these elevator cage dining areas here on this fun-to-read "dining summary" about one woman's experience at EBT Restaurant. Last month I shared these photos of my tea seeds I saved off my new 'Camellia sinensis' or tea plant. Lord willing I'll be trading some at my garden club's first-ever plant and seed swap next week, which ought to be quite a fun evening. At the time I blogged about my seeds, I remember thinking how nice it would be if I could share these seeds with anyone who wanted some, but of course I have just a handful of them from my plant. 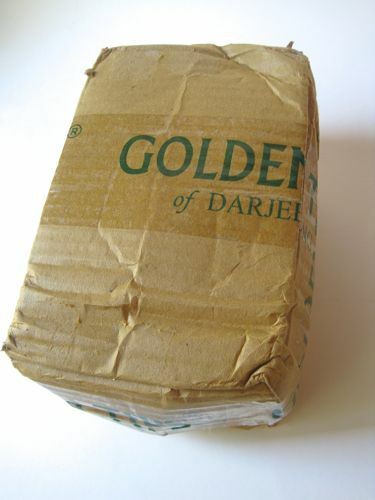 To my delight, I got an e-mail from the United States League of Tea Growers (USLTG) announcing that some quality Darjeeling seeds will arrive in the U.S. next month and you can buy some! "These seeds are freshly collected, with high viability, and have been out-crossed with seed from Darjeeling garden sites above 6,000 feet to ensure some cold hardiness," according to the USLTG. Seeds are just 22 cents each (minimum order is 100), so some of you serious gardeners might want to check this out! 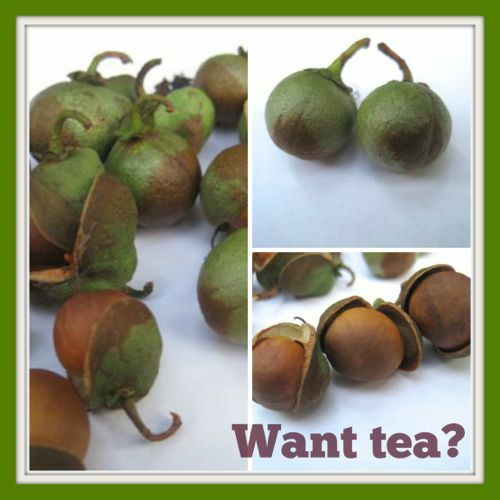 For more info on the seeds, visit the United States League of Tea Growers blog here. How many of you remember the old Mazola margarine commercial with the line, "You call it corn, we call it maize"? 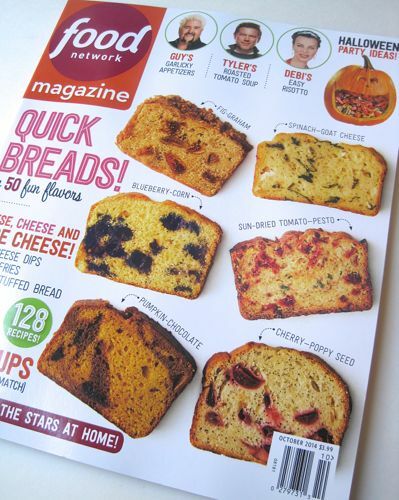 Well, that commercial came to mind because what Food Network Magazine calls quick breads, we tea lovers call tea breads, and they are abundantly featured in the October 2014 issue. I rarely watch the Food Network, but I do purchase the Food Network Magazine occasionally when the cover catches my eye. This one did because all the tea breads on the cover looked so yummy: Fig-Graham, Spinach-Goat Cheese, Blueberry-Corn, Sun-dried Tomato–Pesto, Pumpkin Chocolate and Cherry-Poppy Seed. 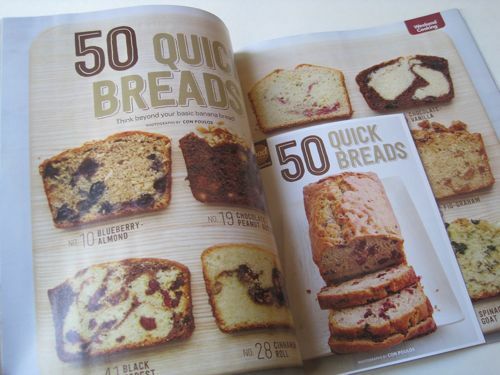 When I saw that a pull-out booklet inside featured 50 recipes for these breads, I was hooked. 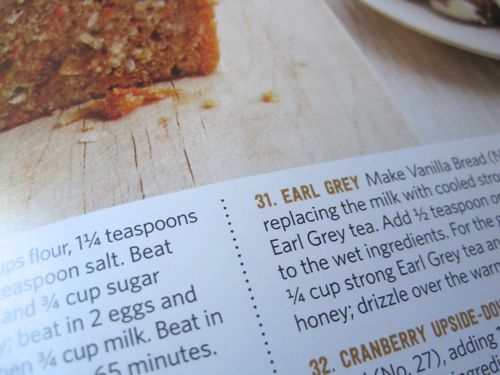 And when I saw a recipe for Earl Grey Tea Bread? Oh yes, I definitely needed this issue. Maybe you do as well? One day last week I was upstairs working when I heard the doorbell ring. UPS and the post office often ring the bell when they leave packages on our doorstep, so I didn't think too much of it. Then I heard the sounds of my husband opening the door and, soon, heading upstairs. "You've got a package," he called out. "OK," I said, a bit puzzled since he usually leaves packages downstairs for me to open when I take a break from work. "I think it's either tea or opium," he said, handing over this uniquely wrapped package. Ahh, well then! 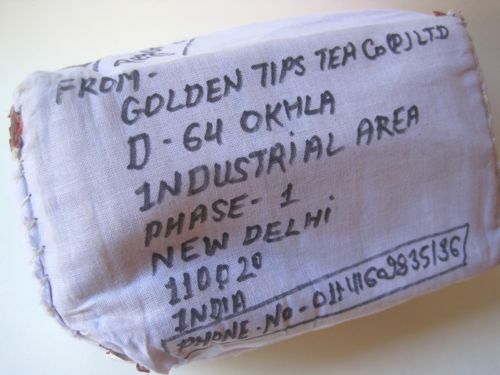 I knew immediately what this was, as I was recently contacted by Golden Tips Tea Company in India about whether I was interested in sampling some of their teas. 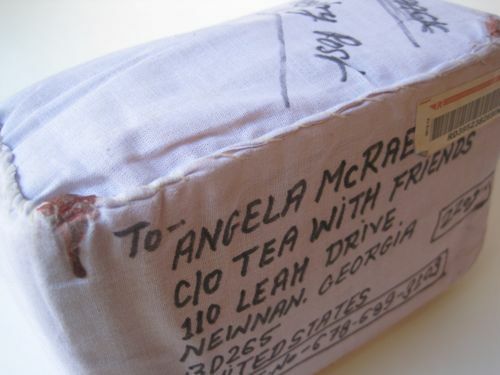 Indeed I was, and of course I was fascinated by the handstitched fabric packaging with protective wax on the corners. 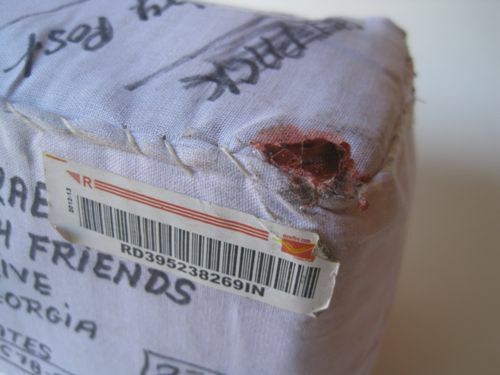 Can you imagine going to this much trouble to mail something? I can't! When I turned the package over, it confirmed that this was what I thought it was! The box did get a bit smushed on the journey, so I guess the Golden Tips folks have learned what they must do to get a package safely to the U.S.! 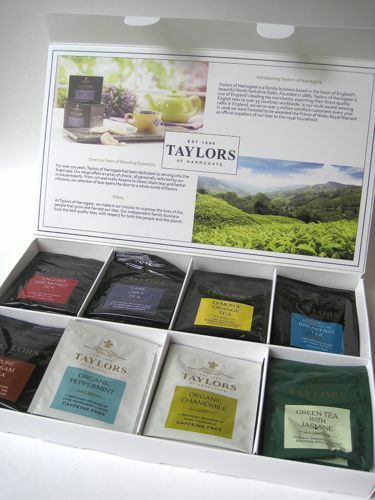 Looking inside the box, I was pleasantly surprised to find a lovely variety of tea offerings, including some Darjeelings and other varieties. 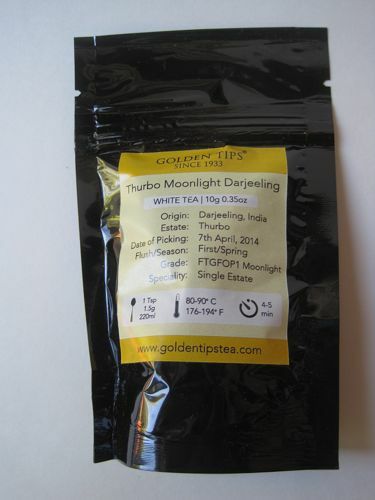 The first one I decided to try was this Thurbo Moonlight Darjeeling. It had an exceptionally fresh, woodsy scent when I opened the package, so I was eager to taste it. 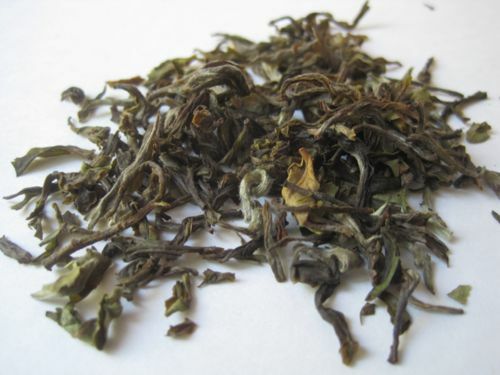 I love seeing the downy little hairs on the tea leaves, and when I steeped this tea, I got a fine, smooth Darjeeling taste. Is it my imagination that it tastes better because I know it was, according to the package, so recently plucked in India? I don't think so. It truly was a fine, brisk tea, with little astringency after I gave it a full four-minute steeping, which is a long time for me. 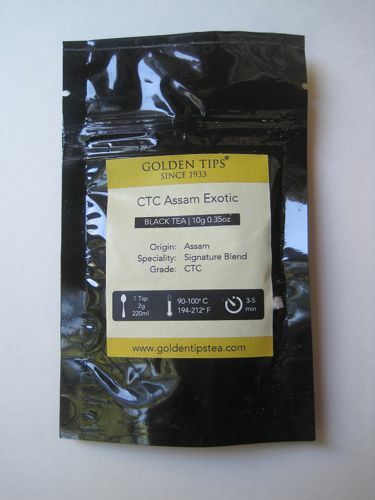 Next I tried this CTC Assam Exotic because I liked the name! I've read that CTC stands for "Crush, Tear, Curl" or "Cut, Tear, Curl" (depending on whom you consult), and at any rate it means the tea was processed by machine. 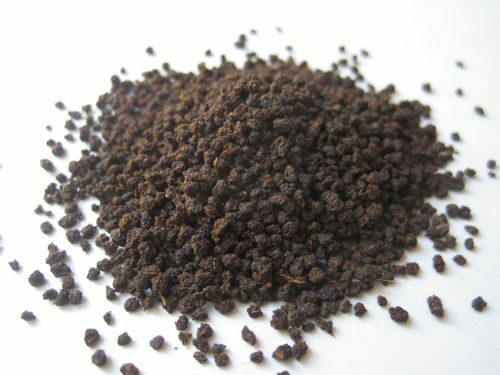 I've seen processed teas with leaf bits the size of instant coffee grounds, but never the size of small peppercorns! 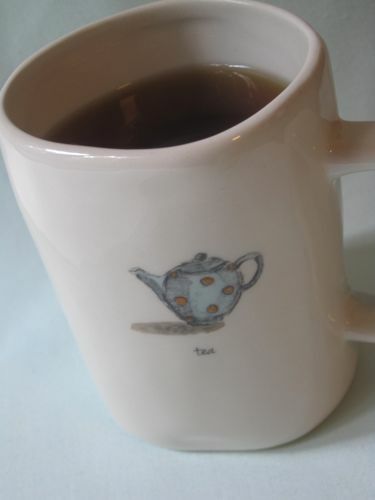 I loved the heady, malty scent of the loose tea, and after I steeped it, I realized I had used too much tea. It was very high octane for my taste, so I tried again with a bit less tea and hit the nail on the head. Absolutely delicious, and it made for a fine, brisk cup of afternoon tea. Now I can't wait to try all the other new teas from Golden Tips. 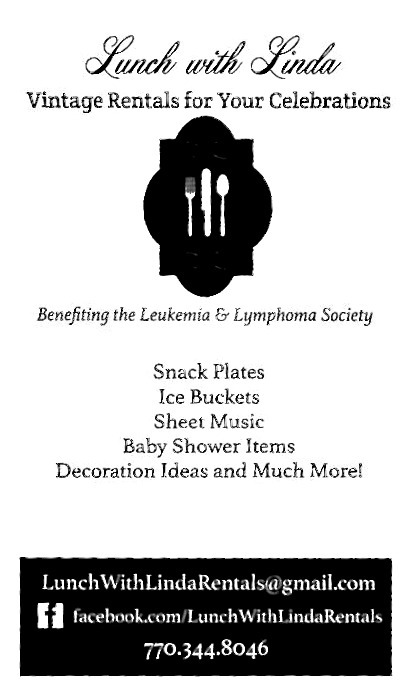 If you'd like to check them out for yourself, go here! I think their shipping prices are reasonable, and if you have an order of $49 order or more (you can always go in with a friend), shipping is free! 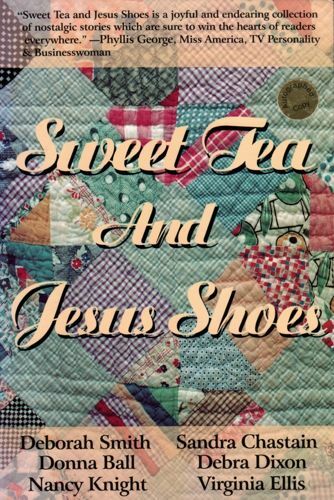 "Sweet Tea and Jesus Shoes"
Not long ago I came across a copy of the book "Sweet Tea and Jesus Shoes" (2000), a collection of short stories by Deborah Smith, Donna Ball, Nancy Knight, Sandra Chastain, Debra Dixon and Virginia Ellis. I usually don't much care for short stories, preferring to read a novel or non-fiction book on a single topic, but I must say I thoroughly enjoyed reading these stories over the weekend! Of course one reason I enjoyed them so much is that they're southern, yet I have a feeling the memories of home, family, community and growing up will resonate with readers no matter where they are from. The first short story, "The Jesus Shoes" by Sandra Chastain, recalls a memorable session of Vacation Bible School. Her memories took me back to Mrs. Jenny Newbern's VBS class where I sang "Onward Christian Soldiers" and learned to make crafts out of popsicle sticks and dry macaroni pieces, beginner craft skills which have served me well in life. 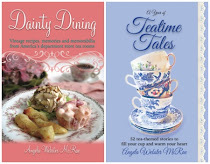 My favorite story in the book was the last one, "Sweet Tea" by Debra Dixon, which tells of a snooty northern visitor who belittles her southern hosts and gets, shall we say, a little something special in her dinner beverage. I won't spoil the surprise in case some of you decide to read this book, but I have always loved watching an "uppity" person get her comeuppance. In my experience, snobs come in all shapes and sizes and certainly from all regions of the country, including mine, but snobbery is simply a sign of bad character no matter where the person's from. The simple life lessons shared in this book were just plain fun to read, and now I'm looking forward to reading the follow-up to this book. Are you a fan of short stories? 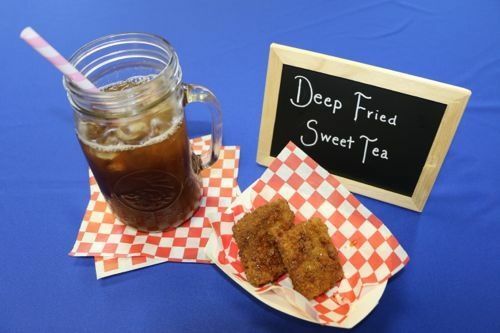 A State Fair of Texas Treat: Deep Fried Sweet Tea! 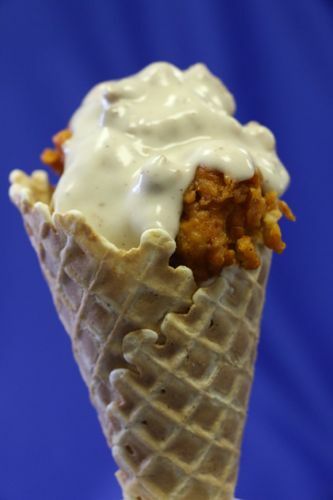 Other treats at the Texas fair this year will include this Texas Fried Chicken in a Waffle Cone. "This tasty treat," they say, "starts with a large crispy waffle cone layered with Texas Fried Chicken and Sausage Gravy until it's piled high and when you get to the bottom of the cone you have a sweet surprise. You get a meal and dessert all in one. Enjoy!" The first time I heard about chicken and waffles was in the pages of an old tea room cookbook, so I certainly raise my glass of sweet tea to this fun idea. Now pork rinds, I realize, are not going to be a hit with everyone, but I like 'em. 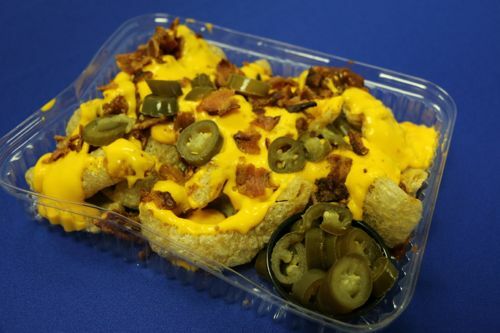 The good people of Texas are, as always, outdoing the rest of us by what they've done with pork rinds for this year's fair, Deep Fried Pork Rind Nachos. Their fresh pork rinds "right out of the fryer" are topped with cheese, chili, pico de gallo and jalapenos. If you don't like the sound of this, fine. I'll eat yours! 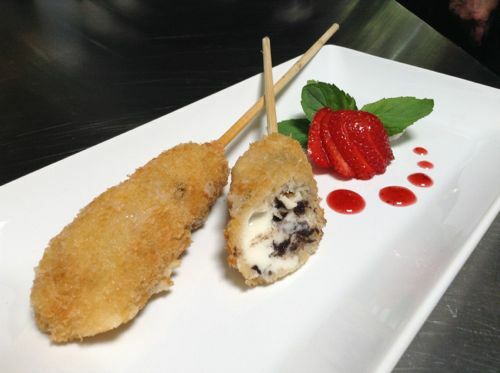 And last but not least, the item I would most like to try after the Deep Fried Sweet Tea is one of these Deep Fried Milk and Cookies on a Stick. Read this description and try not to drool: "Whole milk, half & half and heavy cream are blended with sugar, cookies and slow cooked to make a creamy custard that is chilled for 6+ hours. The finished milky/creamy product is then sliced in thin sections, dipped in an egg wash and rolled in Japanese Bread Crumbs. It is then deep fried and served hot with a sprinkling of powdered sugar and choice of chocolate or strawberry sauce." Oh. My. Goodness. Now I know that mentioning all these *fried* treats will cause some folks to get the vapors, but I would submit to you that we certainly don't eat this way every day and it's OK to splurge a little every now and then! Alas, the fanciest thing I've ever eaten at a local fair or festival is a Deep Fried Oreo (which was OK, but a little mushy). Unless I can come up with a really good reason to visit Texas in the next month, I guess I'll just be content to dream of Deep Fried Sweet Tea. Have you ever eaten any unusual fried foods at a fair or festival? If so, please share! And if you'd like to read about the rest of the new food treats at the State Fair of Texas, visit here. Lately I've had a bit of a challenge finding *mailed* postcards with messages I wanted to share. Bladder problems? Kidney ailments? Two tea room postcard senders had all the details out there for all the world to see! Now I've thought for years that there's a lot of "oversharing" going on with Facebook, but the vintage postcards I've seen lately have reminded me that whining and complaining is nothing new. I read somewhere recently, though, that people who post negative messages on Facebook reinforce those negative emotions, and people who post positive messages multiply their happiness. It doesn't take a rocket scientist to figure out which is the better method, does it? 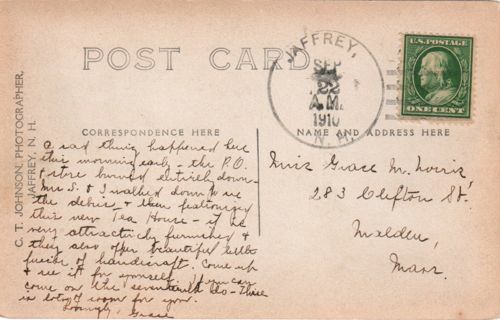 For that reason, I decided not to buy the quaint postcards whose senders were discussing physical ailments and chose this one instead, an RPPC ("Real Photo Post Card") sent from the Sweetheart Tea Room in Shelburne Falls, Mass. in 1918. 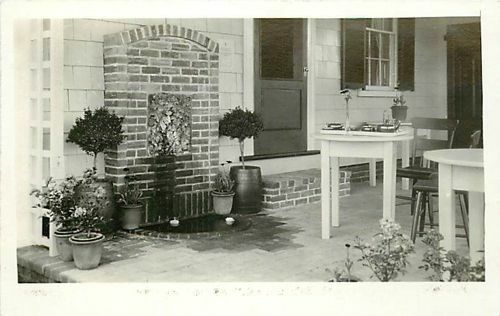 Do you suppose this was the entrance to the tea room? Is that a little money box, perhaps, sitting on the table with the vase holding a flower? 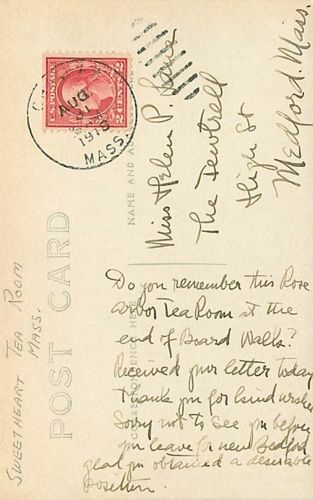 The anonymous sender writes to Miss Helen P. Lane of Medford, Mass., "Do you remember this Rose Arbor Tea Room at the end of Board Walk? Received your letter today. Thank you for kind words. Sorry not to see you before you leave for New Bedford. Glad you obtained a desirable position." That "desirable position" makes me think Helen got a teaching job. What do you think? Tina Simicsak! If you'll send me your snail mail address via the e-mail button at right, I'll get these goodies headed your way. Congrats! 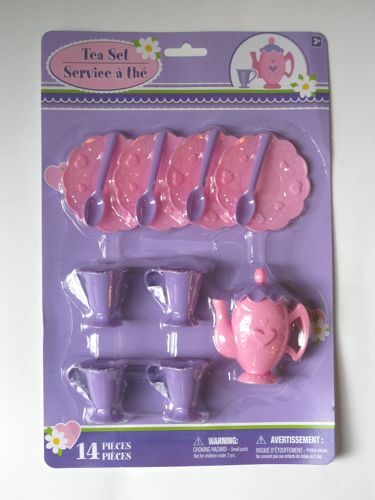 Let's have tea — at Dollar Tree! Oddly enough, it was through a friend that I learned a new Dollar Tree had opened just around the corner from my house. In my defense, it's in the direction of Peachtree City, not Newnan, so that's why I rarely head that way. Thanks to my now-frequent visits to this store with my aunt, I've become quite a fan of DT and love to stock up on all sorts of things like dishwashing liquid, toothpaste and, of course, books. When I visited this new Dollar Tree this week, I found a few tea-ish things I thought I'd share. First, I think these little tea sets would make great stocking stuffers. When I saw them, it was a reminder to start shopping for toy tea sets for our local Christmas toy drive for foster children. 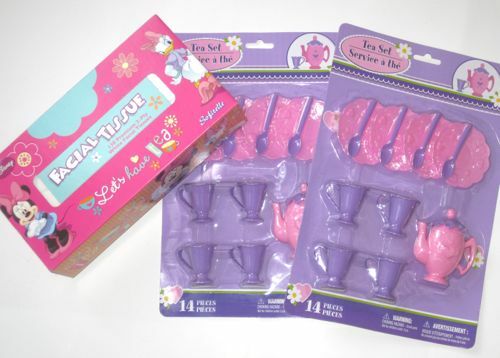 If I pick up a few of these every time I'm in Dollar Tree, that's a lot of little girls who may be converted to future tea drinkers! 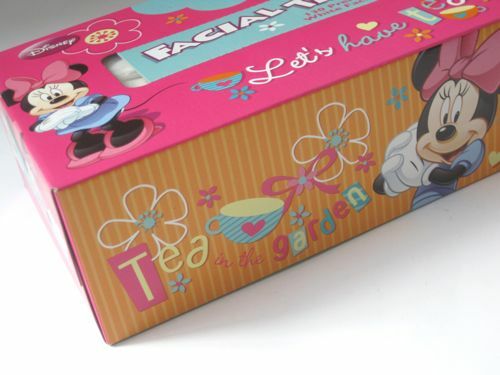 And the other item that made me hit the brakes was this cute box of Disney tissues with a "Tea in the Garden" theme. Funny enough, I'd seen these on my friend Nancy's Rosemary's Sampler blog earlier this week and yes, I coveted her tissues. I admit it. She had said her sister found them at a local dollar store, and I assumed it was some exotic dollar store (is there such a thing?) that we don't have here in Georgia. When I saw this familiar design for just a dollar, it made me so happy I almost cried into my box of tissues! 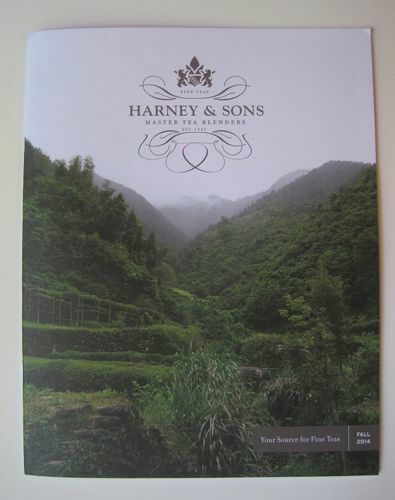 A new Harney & Sons tea catalog arrived in the mail this week, and it struck me that this is the first one I've received since we heard the news of John Harney's passing back on June 17. For that reason, I thought it was especially nice that you open this catalog to find a lovely tribute to the founder. "It is with great sadness," write sons Mike and Paul Harney, "that we acknowledge that our Founder, our Father is no longer with us to give us advice and love. 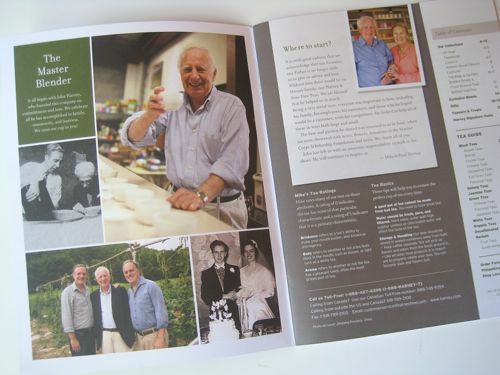 Without him there would be no Harney family, nor Harney & Sons Fine Teas. We are blessed that he helped us so much." The letter also notes that he "has left us with an awesome responsibility: to walk in his shoes." 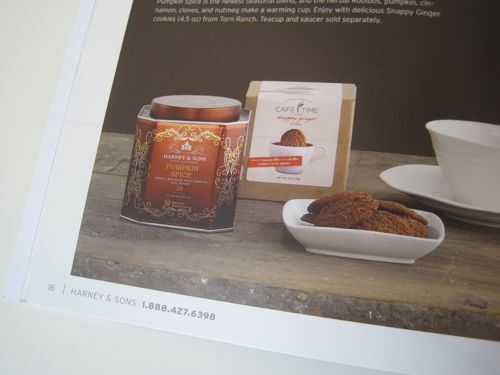 From the looks of this catalog, the Harney legacy is going to be just fine, and I was pleased to see many of the flavors I so enjoy, such as Pumpkin Spice, above, and my longtime favorite for fall, Cranberry Autumn. I don't always keep tea catalogs anymore since I'm trying to cut down on paper clutter, but this one is a special keepsake I'm hanging on to with fond memories of a very special man. 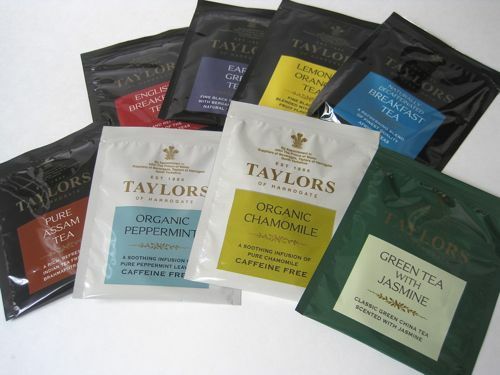 Recently I heard from Brands of Britain with an offer to try some new teas from Taylors of Harrogate. I believe I was first introduced to Taylors of Harrogate teas when the old Holly Cottage Tea Room here in Newnan offered their Tea Room Blend as their signature tea. Naturally, I was happy to receive the new tea samples! 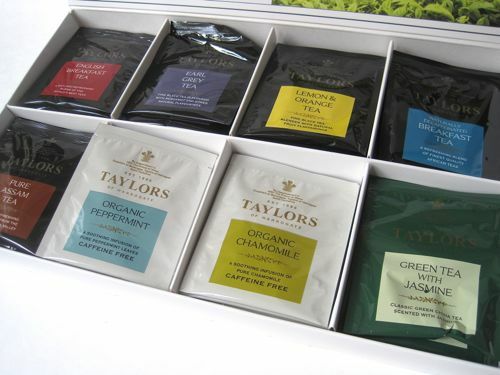 When the box of tea samples arrived, I found that the flavors included English Breakfast, Earl Grey, Lemon & Orange, Naturally Decaffeinated Breakfast Tea, Pure Assam, Organic Peppermint, Organic Chamomile, and Green Tea with Jasmine. So far I've sampled the Lemon & Orange (a bright, clean flavor with equal amounts of lemon and orange), the Pure Assam (a great brisk, malty tea) and the Organic Peppermint (a lovely caffeine-free tea which reminds me very much of my beloved Candy Cane Lane Tea). Now I can't wait to try all the others! 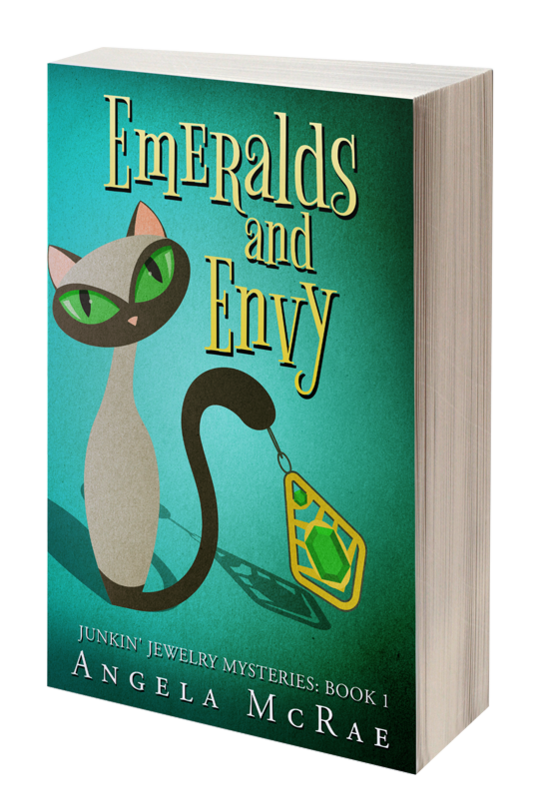 And since they generously sent me so many samples, I've decided to include a sample of each of the eight flavors in this week's giveaway (see Monday's post), so if you haven't entered yet, be sure to do so! 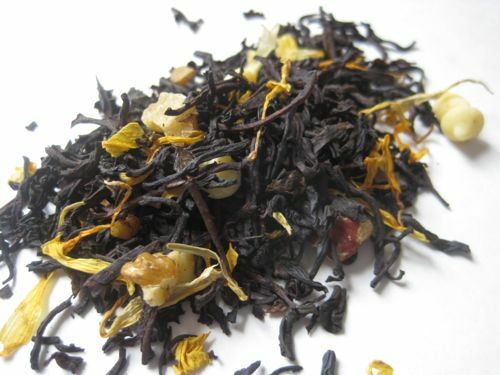 Learn more about these teas at the Brands of Britain website here! 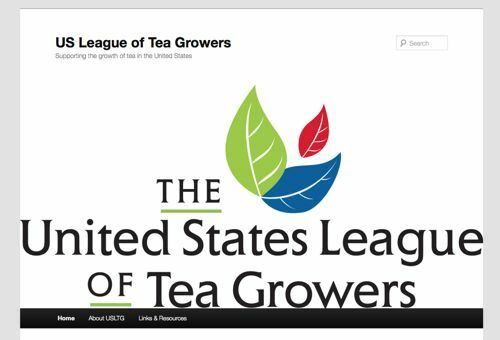 It was with great interest that I recently read about a new tea group, the United States League of Tea Growers. The group was founded in 2013 to support, just as the name says, the growth of tea here in the United States. I have enjoyed reading their blog (found here) and discovered all sorts of useful information, including a guide to germinating camellia sinensis seeds (it's here). The USLTG project I am most interested in is their support of the tea mapping project at the University of North Carolina. This project will create maps of the mean annual precipitation, soil pH and temperature for tea plantations in the continental U.S. as well as a map of tea plantations in Hawaii. If you'd like to read more about the project, click here. I look forward to learning more about U.S. tea growing efforts thanks to this great new resource! Time for a September Giveaway! 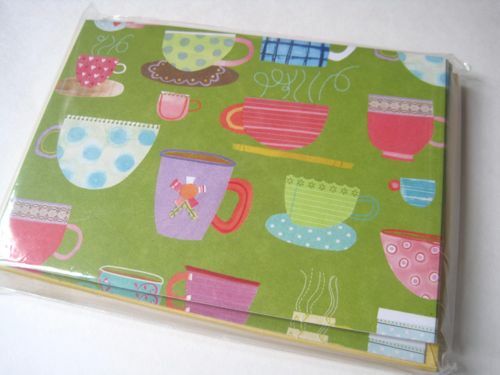 The other day at Michaels I noticed they had just one of the cute little teacup zippered pouches like I bought for myself earlier in the summer. I decided someone who appreciates teacups really needed to have this last one, so I got it to include with the September giveaway, which includes the goodies shown here! 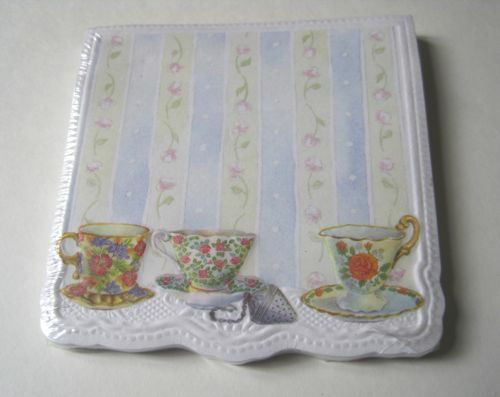 And then there’s little pad of 50 sticky notes from Carol Wilson Fine Arts with her lovely teacup designs on them. 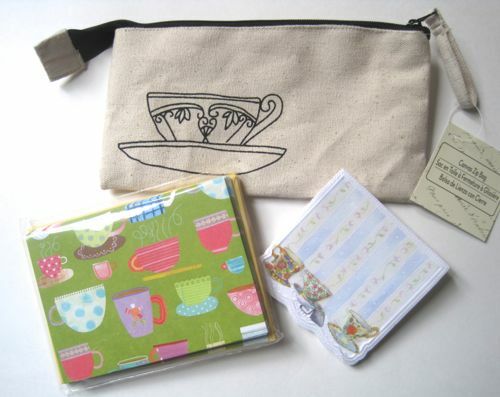 Want to win these teacup-themed treats? Just leave a comment to this post between now and 7 a.m. EST Friday, Sept. 19, and you’ll be entered to win. (U.S. and Canada only, please.) Good luck! Sometimes I find a vintage tea room postcard online and purchase it not knowing what the message on the back says. In such cases, it's always interesting when the card arrives so I can see what story it tells. That was certainly the case with this card mailed to Miss Grace Norris in Massachusetts in 1910. “A sad thing happened here this morning early. The P.O. and store burned entirely down. Mrs. S. & I walked down to see the debris, and there (?) our joy this new Tea House. It is very attractively furnished & they also offer beautiful little (fusion?) of handicraft. Come up & see it for yourself. If you can come on the seventeenth do - There is lots of room for you. Lovingly, Grace." I was so sorry to hear the local post office and store burned down, but at least there was a nice new tea house in town! When my friend Liz was over for her daughter’s tea on Saturday, she sniffed a lot of my teas and wanted to try two in particular, this Cranberry Blood Orange Rooibos from The Boston Tea Company and the Tupelo Honey Fig from Tea Forté. Alas, as soon as she left with the bridesmaids I realized I’d failed to send her home with the samples. It’s a pity, too, because remember those cute little mini tins I found recently? (They’re here.) Those would have been perfect for sending her home with some samples! Instead, I grabbed some of my handy make-your-own teabags and popped two samples in the mail, storing each blend in a different plastic bag. 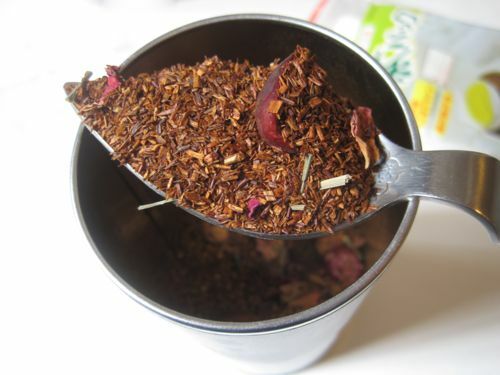 First, a nice big scoop of Cranberry Blood Orange Rooibos, making sure to send some bits of the dried berries. And then a much different looking tea, the Tupelo Honey Fig with its mossy green colored bits. I’m not sure I’ve ever mailed loose leaf tea before, so I do hope it survives the trip. And will the two scents compete by the time they arrive at my friend’s home? I hope not. 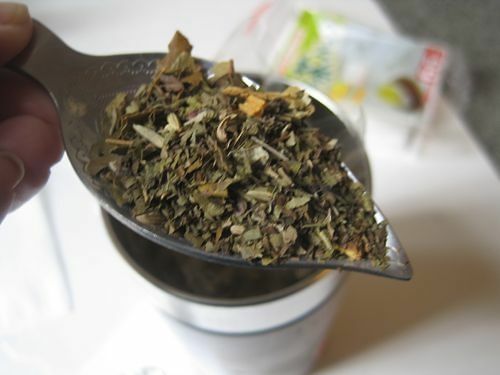 Have you sent samples of loose tea in the mail before? If so, how did you do it? 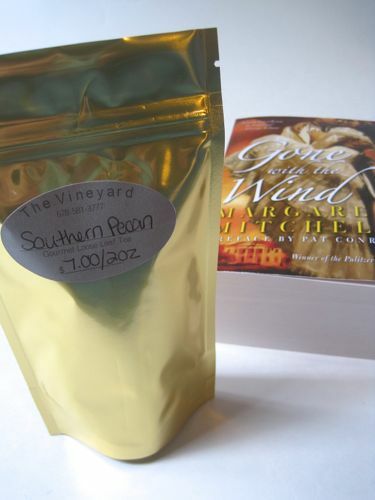 When my aunt and I went to Marietta’s Vineyard Cafe and the “Gone With the Wind” museum a few weeks ago, I made two purchases which I see as companions: a new copy of the novel from the museum gift shop, and some of the Vineyard Cafe’s Southern Pecan Tea. I’ve had a bee in my bonnet for a while now to re-read GWTW and focus on the food and decor, so I bought a paperback copy I can feel free to mark up. And as I read, it just seemed appropriate to have a “southern” tea, so Southern Pecan sounded perfect! 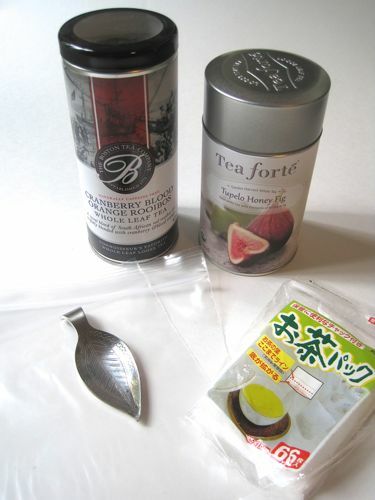 I couldn't find the ingredients for this tea listed online, but it's what I'd call a traditional "dessert" tea with sweet notes and appears to contain black tea, pecan pieces, mini white chocolate chips and flower petals (sunflower, perhaps). It's a very tasty combination! 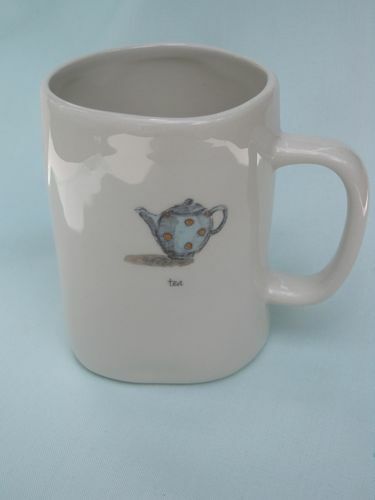 Do you try to match teacups to teas and books? I do sometimes, and the only china I could think of that would be just right for Scarlett O’Hara would be something Irish, which I don’t happen to have, but I do think of all those green dresses when I think of Scarlett, so I settled on this green teacup. 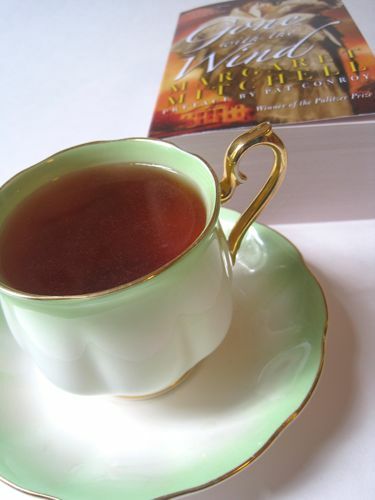 If you were re-reading GWTW, which teacup would you choose? After seeing this $3.99 tea mug a few times at both T.J. Maxx and Marshalls lately, I decided its wonky personality would come in handy on those days I'm feeling a little offbeat myself! 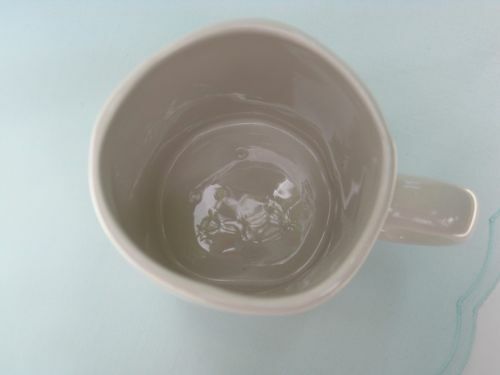 It's a little hard to tell from the photo, but this tea mug is purposely (I think) misshapen, like someone grabbed the ceramic before it had quite settled into its shape. There's a wonky shape to the rim and a wonky little dip in the base, too. It's a little easier to see from overhead here. I don't know why exactly, but this imperfect tea mug makes me smile. If you're feeling a little wonky yourself, maybe you'll want one too! A Bridesmaids Luncheon & Tea for Cydney!